Ah, Florida...the Sunshine State! Well, usually. The Walt Disney World area is known for its sunshine, and also for its crazy, here-one-moment-gone-the-next thunderstorms. So how do you prepare for the wide range of weather you might encounter while on your WDW vacation? Plan ahead...and be prepared! While I know a lot of people worry about whether they'll get rained on during their stay, quite often when it does rain it doesn't last a long time and you can usually expect to see storms in the late afternoon, mostly during the summer months. Rain is pretty easy to handle-a few ponchos that you buy beforehand at your local dollar store will let you keep on roaming the parks. Be sure to check out my earlier post on what to do at WDW when it's raining for ideas to keep you dry. Just throw on a poncho and keep on going! The sun and heat...that's what a lot of people first think of when it comes to Florida weather. The heat is worst from June thru September-the same time frame when you'll see the majority of the rainy weather as well. Summer days can see temperatures soar into the nineties with humidity levels to match. While staying hydrated is always important, it's even more so during the scorching summer months. You may not think you need that drink of water, but believe me-you do. If you're already thirsty, you may already be dehydrated...and if you've been sweating and the sweat stops-though the heat hasn't-that's a big red flag that you need to grab something to drink. Don't keep pushing yourself without properly hydrating your body along the way or you may find your magical vacation losing all of its pixie dust very quickly. Sunscreen (including lip balm with sunscreen in it), hat, sunglasses-necessities in the Florida sun! To go along with staying hydrated, I can't stress enough the importance of using sunscreen. Have you ever gone on vacation and seen people wandering around looking like they just stepped out of a pink paint factory because they've gotten a really bad sunburn? Trust me, you don't want to end up like that-and in addition to the pain that a horrible sunburn can cause, you're upping your chances of skin cancer every time that happens. Central Florida sees sunshine almost every day-even if there's cloud cover, the powerful Florida sun's rays are still getting through...and you won't realize it until that night when you take a look at yourself in the mirror. And don't let those cooler late fall, winter and early spring days fool you-the sun is still strong and will still burn you if you don't take precautions. So pack your sunscreen (I'd use one with a minimum 30 SPF), wear a hat, put that 30 SPF lip balm on...and while you're at it, don't forget those sunglasses as that same Florida sun that will burn your skin will also be blinding to your eyes. Now, back to those cooler months. Things start to cool off a bit around mid to late October and stay that way until around the end of March. December thru February is usually extraordinarily pleasant with very little rain, comfortable temperatures usually with highs in the mid-70s and plenty of sun. But don't let that fool you--every now and then it can get a bit chilly, especially during the winter nights when you might see temperatures dip into the 50s or even 40s (and yes, 30s are not unheard of!). Okay, Florida's idea of chilly might be your idea of shorts and a tank top back home, but relatively speaking...you get my drift, right? And for a real anomaly, look no further than Disney's Marathon Weekend from 2010. That Saturday we had snow flurries, sleet and freezing rain and on Sunday after the wet weather moved out, lows dipped into the teens in the early hours of the pre-dawn morning. Yes, really. So your Tuesday tip is to be prepared--check and re-check the weather before you go. WDW's zip code is 32830, so you can use that on whichever is your favorite weather site to check your 10-day, 5-day, and next day forecast so you can plan appropriately-not just for those bikinis and shorts, but also for those sweatshirt and jacket kind of days. And remember, regardless of the temperature, rain or clouds...always, always, always bring your sunscreen. How do you prepare for the crazy Florida weather for your WDW trips? 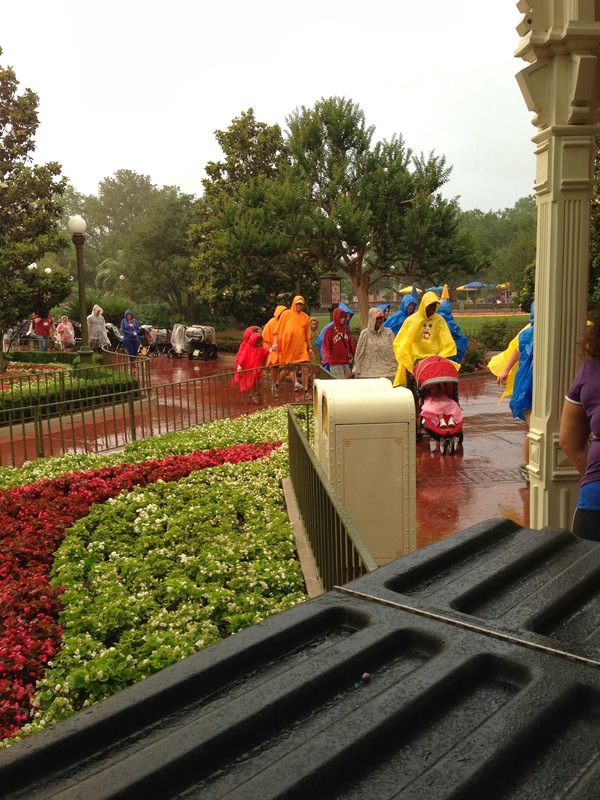 What's the wildest, oddest or most unexpected weather you've experienced while at WDW? I was there for that Marathon Weekend! Thank God we had driven down from the Northeast where it had been snowing so I had my winter jacket. I would have frozen if I didn't have it.